Following in the tradition of last year, St Charles Sixth Form College students held yet another successful Coffee Morning for Macmillan nurses on the 29th of September 2017 during the College’s morning break time. 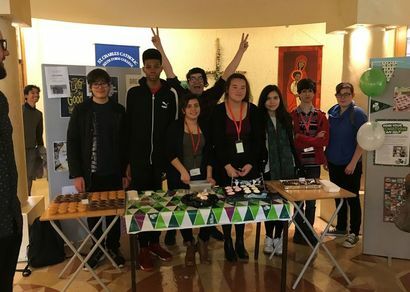 Some enthusiastic and energetic students from the College’s Learning Support department led on this fundraising event, donating super delicious cakes and muffins and decorating their stall so splendidly. The ‘World’s Biggest Coffee Morning’ is Macmillan’s main fundraising event for people dealing with cancer. There are now 2.5 million people in the UK facing cancer and Macmillan aim to provide medical, emotional and financial support for these individuals. Macmillan kindly ask people all over the UK to hold their own Coffee Morning to raise money for this cause. Andrew O’Dell and Jade Slocock, two of our volunteer students who helped out at this charity event, described the coffee morning as “a fun thing to do but for a very serious cause”. 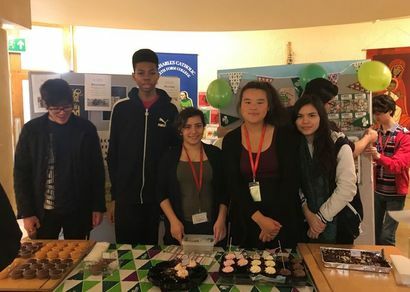 They were both instrumental with their peers Akintola, Ghazal, Sam, Amir, Kevin and Megan on encouraging other students to give generously to this worthy cause. Overall they helped raise over £70 for Macmillan Cancer Support which was fantastic for 15 minutes hard selling of yummy cakes!